I recently decided to hike the north loop of the Pinchot Trail, but include the Watres Trail and the view from Big Pine Hill. I reached the main trailhead to see that it has been re-furbished with new signs and other amenities. The Pinchot in the spring is a trail of endless green with every imaginable hue and shade. The trail wandered through spruce, hardwoods, and thickets of mountain laurel and blueberries. Sheep laurel battled though the layers of vegetation for a glimpse of the sun. The laurel was on the verge of blooming; what an amazing flora display it will be. I crossed Spring Run as it flowed from the ground into a pond of sorts, it looks as if beavers have dammed the creek. The trail meandered up hill through jungles of laurel. I soon reached the yellow blazed Watres Trail, where I turned right. The Watres Trail is not as well established, but is still a nice trail as it explored more woodlands, meadows, and ledges. It passed near a boulder field that is flooded in early spring, creating an odd pond filled with rocks. I soon reached scenic and pristine Panther Creek, which the trail followed a little ways until the creek disappeared into a ravine. Although there were no established sites, there is some good potential camping along this creek. The Watres Trail climbed up to the ridge and explored hardwood forests with carpets of ferns before descending towards Painter Creek through a tunnel of hemlock. The hemlocks looked healthy throughout the forest with lots of new growth. Looks like the harsh winter helped them against the wooly adelgid. I returned to the Pinchot Trail and turned right, passing a nice campsite and crossing Painter Creek. I passed a father and son backpacking and told them the campsite was just ahead. I crossed a road and continued up to a side trail that took me to the top of Big Pine Hill. Several people were at the vista, enjoying the view in a brisk wind. One man was talking about visiting Choke Creek Falls next, another had a large camera and tripod. Views over the rolling plateaus stretched in every direction, you could probably see for 20-30 miles. The sun fought through the fast moving clouds. I returned to the parking area to see it packed with cars. On the drive out, I passed several kids and two adults backpacking. Nice to see people enjoying the trails. The north loop of the Pinchot Trail is a great overnight backpack or as a long dayhike. You can extend the trip by taking the Watres Trail, which is even more isolated. This yellow blazed half loop begins and ends on the Pinchot Trail. 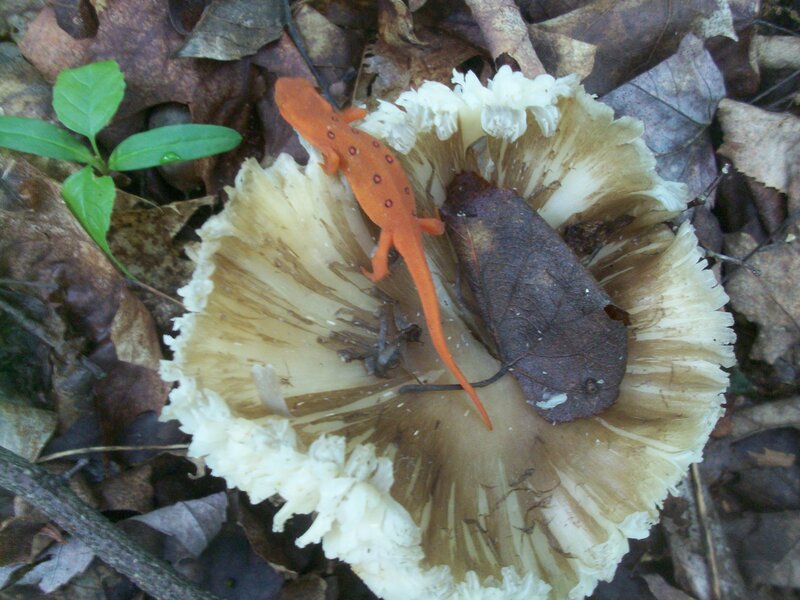 Information on the Lackawanna State Forest. Located just outside of Wilkes-Barre, is a place of great natural beauty. The Seven Tubs Natural Area features the chasms, slides, and potholes carved by Wheelbarrow Run. Over the eons, this small stream has flowed over the sloping bedrock, slowly carving its way down, creating a truly unique place. In places, the chasm is so narrow, you can almost step across it. Ledges and cliffs reach over the tubs, concealing them in the shadows below. The Seven Tubs Natural Area is hike no. 18 in Hiking the Endless Mountains. We began by hiking up an unblazed, eroded trail on the east side of the chasm. 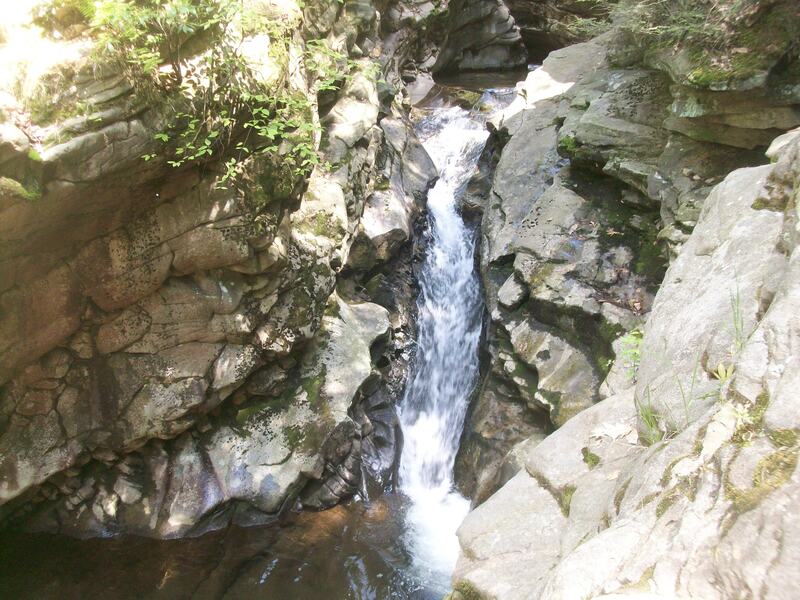 We carefully hiked along the ledges to peer into the gorge below with its waterslides and sculpted pools. The trail followed a steel staircase down to the water and then we followed the trail down the west side of the chasm. We passed the footbridge and began the hike up along Laurel Run, which is just as beautiful with waterfalls, slides and more pools. Along the way we passed several pink lady slippers. This is a wonderful stream-side hike. It was also great to see a lot of hikers on the trail. The trail then followed a small tributary with some waterslides and then we hiked along a ridge away from the streams. We descended back to the tubs, hiked back to the footbridge we bypassed initially, and returned to the car. This hike is fairly easy with no big climbs and it offers a lot of scenery. This loop is less than three miles in length. It is a good hike for children as it offers so much to interest them, but keep a close eye on the kids around the tubs. Location of the trailhead to hike the Seven Tubs.